Frequently these days, people who care about the plight of farm animals are taking their case to court. Thanks to a number of laws passed with the support and backing of groups such as the Humane Society of the United States (HSUS), those concerned with animal welfare are able to use the legal system to protect the farm animals. A federal appeals court has ruled California can keep in place its ban on selling foie gras. A Los Angeles court will still hear the case against the ban, but in its decision, the ninth US circuit court of appeals expressed doubt that opponents of the law would be successful. The law bars state farmers from force-feeding ducks with a tube, the procedure used to produce foie gras. It also bans sales of the delicacy. The legislature concluded tube-feeding ducks and geese to engorge their livers is cruel. Foie gras is made by feeding the birds for 10 to 13 days through tubes inserted in their esophagus. As a result their livers are greatly enlarged often to the breaking point. The court said there was no doubt that California banned the sale of foie gras to discourage its consumption, and to “prevent complicity in a practice that it deemed cruel to animals.” The court’s decision means the ban, which took effect in July 2012, may continue to be enforced. 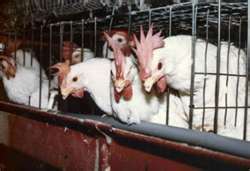 In another case, the Superior Court of California in Fresno County has upheld Proposition 2, the California ballot measure banning the inhumane confinement of egg-laying hens, breeding pigs and veal calves in cages so small the animals cannot stretch their limbs, lie down or turn around. The ruling is a result of the third unsuccessful lawsuit by some in the egg industry challenging the measure. “We sincerely hope the Court’s ruling will put this objection to rest once and for all,” said Jonathan R. Lovvorn, senior vice president and chief counsel for animal protection litigation for HSUS. California’s Proposition 2 was enacted in 2008 by a statewide vote of more than 63 percent. It won majorities in 47 of 58 counties, including in many top agricultural and rural counties. The measure granted producers a phase-in period of more than six years to transition to more humane housing systems, and is scheduled to take effect on Jan. 1, 2015. In a different kind of case linking factory farming to environmental pollution, a coalition of community, animal welfare and environmental organizations is filing a lawsuit against the United States Environmental Protection Agency (EPA). This lawsuit challenges the Agency’s withdrawal of a proposed rule that would have allowed EPA to collect basic information, like locations and animal population sizes, from factory farms. The Center for Food Safety, Environmental Integrity Project, Food & Water Watch, HSUS, and Iowa Citizens for Community Improvement filed the suit in the U.S District Court for the District of Columbia, arguing that the Agency’s withdrawal of the proposed rule lacks the rational basis required by law. The information at issue is critical to the EPA’s ability to protect waterways from pollutants produced by factory farms, one of the country’s largest sources of water pollution. These court cases are often viewed as stepping stones to a more vegetarian future. Meat raised under harsh conditions is cheap. By imposing more humane standards through the law cheap meat becomes harder and harder to produce, and another step to the eventual end of the dollar burger is taken. Much of the public is currently unaware of the environmental realities of factory farming. However, once the EPA starts keeping track of the enormous water pollution created by factory farming livestock, the wider public will become increasingly aware that the environmental and financial cost of the water pollution caused by meat production is both unsustainable and expensive, and another step towards the more environmentally-responsible, plant-based diet will have been taken.